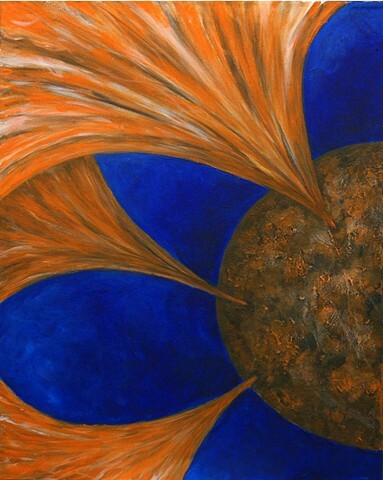 This is an abstract painting inspired by solar flares, which erupt when magnetic energy builds up in the solar atmosphere, and is suddenly released in bursts of light and radiation, ranging from radio waves to gamma rays. Solar flares range in intensity (Classes A, B, C, M and X), and can cause effects on Earth such as radio blackouts and magnetic storms in the upper atmosphere. Fortunately, the largest solar flares are not common, and Earth has protection from minor flares through its atmosphere and magnetic field. However, astronauts and spacecraft have to take special precautions to avoid being damaged when solar flares occur.